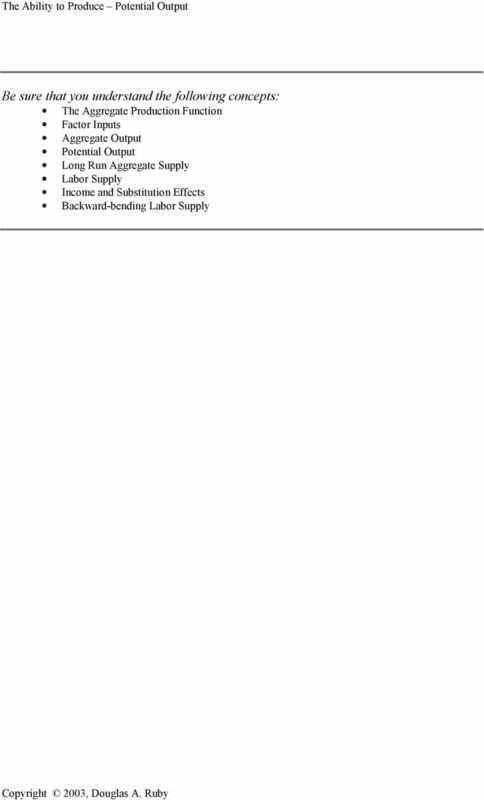 Download "POTENTIAL OUTPUT and LONG RUN AGGREGATE SUPPLY"
1 POTENTIAL OUTPUT and LONG RUN AGGREGATE SUPPLY Aggregate Supply represents the ability of an economy to produce goods and services. In the Long-run this ability to produce is based on the level of production technology and the availability of factor inputs. This relationship can be written as follows: Y* t = f(l t, K t, M t ) where Y* is an aggregate measure of potential output in a given economy. In the aggregate, L t represents the quantity and ability of labor input available to the production process, K t represents capital, machinery, transportation equipment, and infrastructure, and M t represents the availability of natural resources and materials for production. Over time with growth in the availability of factor inputs or technological improvement, the level of potential output is expected to increase. Thus in the Long-run we define the Aggregate Supply (AS LR ) function as being influenced by those elements included in the production function defining the level of potential output but independent of the price level. 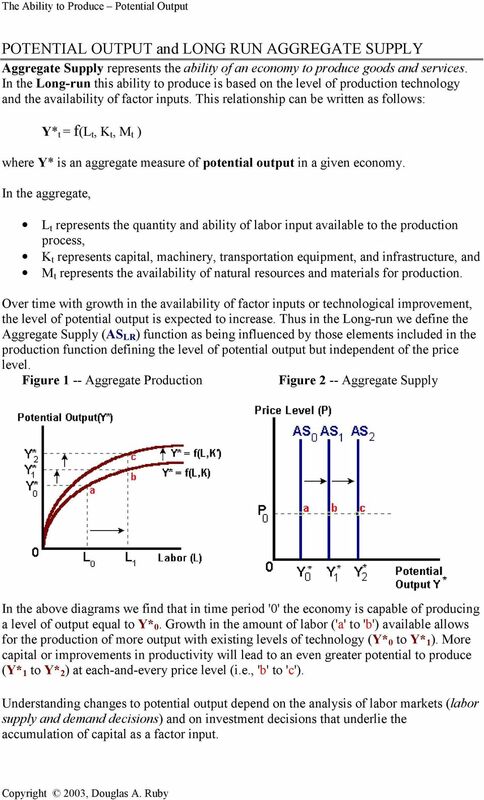 Figure 1 -- Aggregate Production Figure 2 -- Aggregate Supply In the above diagrams we find that in time period '0' the economy is capable of producing a level of output equal to Y* 0. Growth in the amount of labor ('a' to 'b') available allows for the production of more output with existing levels of technology (Y* 0 to Y* 1 ). More capital or improvements in productivity will lead to an even greater potential to produce (Y* 1 to Y* 2 ) at each-and-every price level (i.e., 'b' to 'c'). Understanding changes to potential output depend on the analysis of labor markets (labor supply and demand decisions) and on investment decisions that underlie the accumulation of capital as a factor input. 3 Points on the curve IC 1 represents combinations (or bundles) of income and leisure that give the individual a higher level of satisfaction. The line 'XY' represents the budget constraint imposed by the number of waking hours available in a day (note: the horizontal intercept is equal to 16. The vertical intercept is determined by the maximum amount of income that can be earned at prevailing real wage rates w (in this case w equals $10/hr.) The slope of this budget constraint is then determined by the real wage rate. See: The Digital Economist: In any model of individual behavior, an equilibrium exists where an indifference curve is just tangent to the budget line. This represents the maximum level of utility that can be obtained given the parameters of the constraint. In the diagram above this occurs at point 'R'. 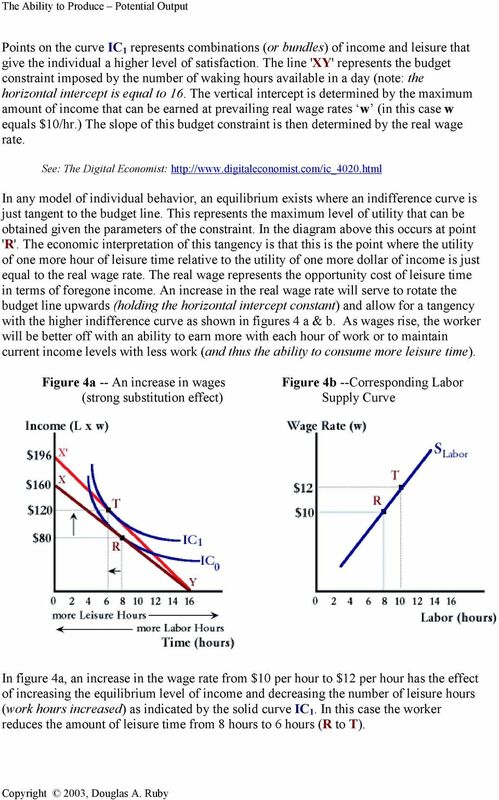 The economic interpretation of this tangency is that this is the point where the utility of one more hour of leisure time relative to the utility of one more dollar of income is just equal to the real wage rate. The real wage represents the opportunity cost of leisure time in terms of foregone income. An increase in the real wage rate will serve to rotate the budget line upwards (holding the horizontal intercept constant) and allow for a tangency with the higher indifference curve as shown in figures 4 a & b. As wages rise, the worker will be better off with an ability to earn more with each hour of work or to maintain current income levels with less work (and thus the ability to consume more leisure time). Figure 4a -- An increase in wages (strong substitution effect) Figure 4b --Corresponding Labor Supply Curve In figure 4a, an increase in the wage rate from $10 per hour to $12 per hour has the effect of increasing the equilibrium level of income and decreasing the number of leisure hours (work hours increased) as indicated by the solid curve IC 1. In this case the worker reduces the amount of leisure time from 8 hours to 6 hours (R to T). 4 It could have been the case that the new equilibrium point was defined by the curve IC 1 ' in figures 5 a & b. In this case the worker reduced the number of work hours upon receiving the wage increase. Both cases are theoretically possible due to the relative size of the income and substitution effects. The total change in leisure hours is called the total effect which is the summation of income and substitution effects. With a wage increase, leisure time becomes relatively more expensive (in terms of foregone wages) so the worker will substitute away from leisure time -- the substitution effect is negative for a wage increase. Figure 5a -- An increase in wages (strong income effect) Figure 5b -- Corresponding Labor Supply Curve Additionally, as income rises with the wage increase individuals will want to consume more leisure assuming that this good is a normal good -- the income effect for a wage increase is always positive. If the positive income effect is less than the negative substitution effect, the total effect will be negative and the worker will consume less leisure and more work. This will lead to a "normal" upward sloping labor supply curve (the relationship between the real wage and labor hours supplied) as seen in figure 4b. If the income effect is greater than the substitution effect, the worker will consume more leisure (a positive total effect) and less work. 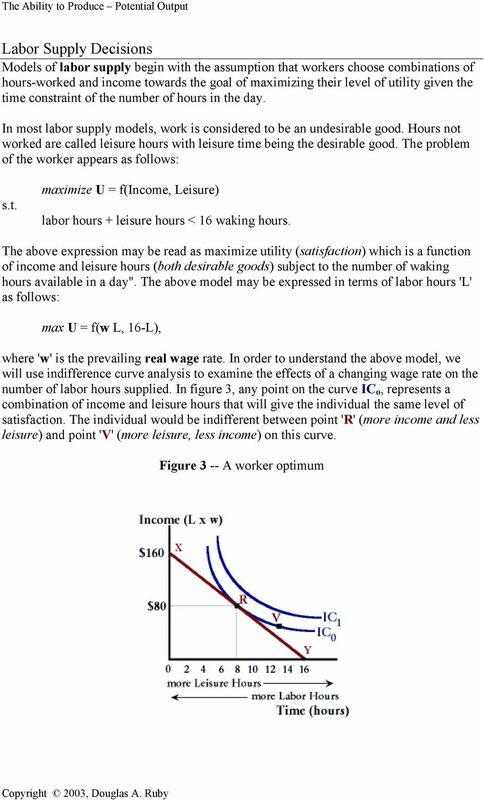 In this case the labor supply curve will be "backward-bending" or represent an inverse relationship between the wage rate and labor hours supplied (see Figure 5b). Empirical studies have concluded that, when we aggregate among all workers, the labor supply curve is upward sloping and fairly steep (that is, labor supply decisions are highly wage inelastic or insensitive to changes in the wage rate). Stronger influences on labor supply come about with changes in population, labor force participation rates (demographic changes) and immigration flows. 6 Figure 7, An Increase in Labor Productivity In reality, this type of shock when matched with an upward sloping labor supply curve should lead to an increase in the real wage. This higher real wage is necessary to induce more workers into the labor market or to induce existing workers to work longer hours (in both cases sacrificing leisure time). This is shown below in figure 8. 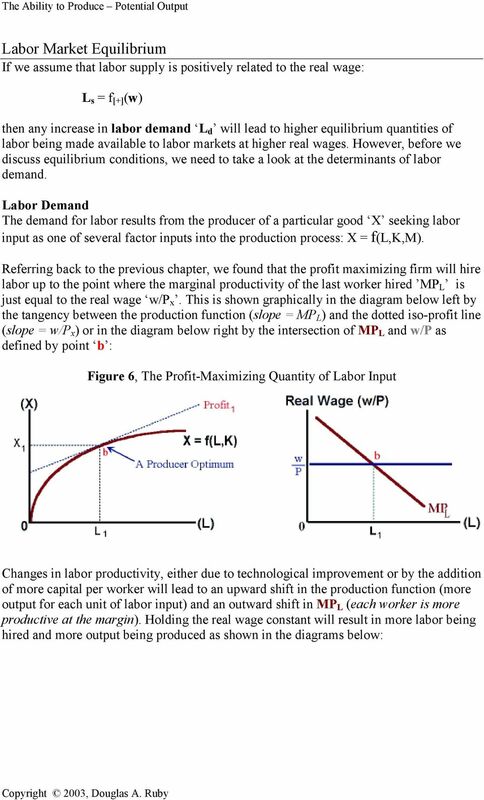 The increase in productivity shifts the production function upwards and the marginal product of labor outwards (b d). 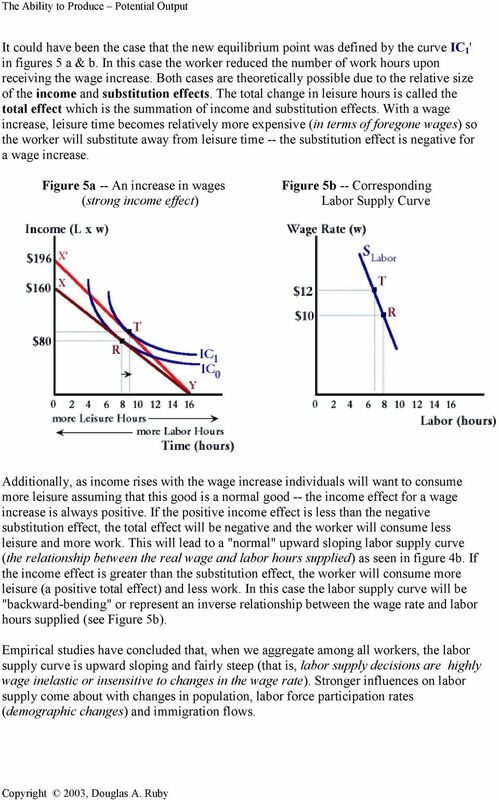 However, this excess demand for labor leads to an increase in nominal and real wages leading to an upward movement along the new labor demand curve in the right diagram and a counter-clockwise rotation in the iso-profit line in the left diagram (d f). 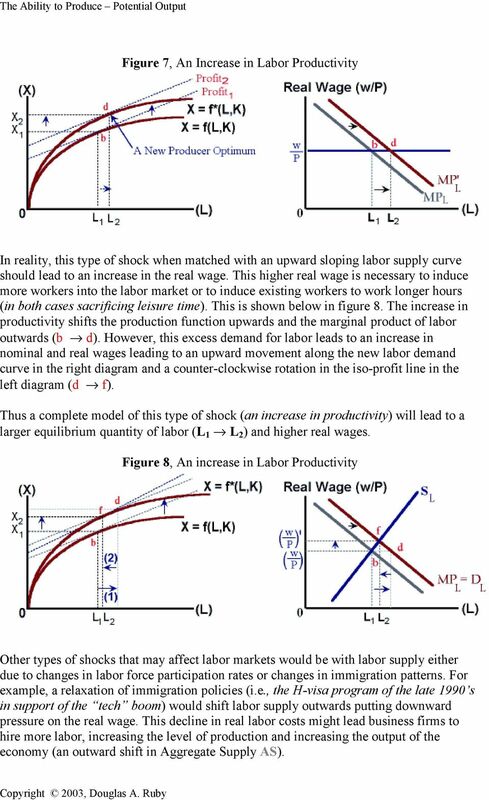 Thus a complete model of this type of shock (an increase in productivity) will lead to a larger equilibrium quantity of labor (L 1 L 2 ) and higher real wages. Figure 8, An increase in Labor Productivity Other types of shocks that may affect labor markets would be with labor supply either due to changes in labor force participation rates or changes in immigration patterns. For example, a relaxation of immigration policies (i.e., the H-visa program of the late 1990 s in support of the tech boom) would shift labor supply outwards putting downward pressure on the real wage. This decline in real labor costs might lead business firms to hire more labor, increasing the level of production and increasing the output of the economy (an outward shift in Aggregate Supply AS). Labour is a factor of production, and labour, like other factors, such as capital (machinery, etc) are demanded by firms for production purposes. Microeconomics Instructor Miller Practice Problems Labor Market 1. What is a factor market? A) It is a market where financial instruments are traded. B) It is a market where stocks and bonds are traded. Chapter 6 MULTIPLE-CHOICE QUETION 1. Which one of the following is generally considered a characteristic of a perfectly competitive labor market? a. A few workers of varying skills and capabilities b. Figure 2-7. Figure 2-7 shows the production possibilities frontiers for Pakistan and Indonesia. Each country produces two goods, cotton and cashews. Chapter 14 Competitive Market Equilibrium We have spent the bulk of our time up to now developing relationships between economic variables and the behavior of agents such as consumers, workers and producers. Practice Question ECON 203 Intermediate Microeconomics Utility and Choice 1. As long as the principle of diminishing marginal utility is operating, any increased consumption of a good a. lowers total utility. This Appendix has been written and supplied by Paul J. Feldstein. It represents a prepublication document that Professor Feldstein will include in his forthcoming Sixth edition of Health Care Economics.